Up until December of her junior year, Amanda Wagstaff '10, had planned on graduating with a major in anthropology. "I'm interested in people," she explained. "I'm interested in history and culture and how people connect. And I'm still interested in that but now it's translating more into art." According to Wagstaff, when she first arrived at the College art "wasn't in the picture at all." The senior, who will graduate in May and eventually plans to study for her master's in art, said her initial hesitation stemmed from a lack of any formal training. Encouragement came one day during her junior year when she approached a professor about an art history internship and received an unexpected reply. According to the senior, the professor looked at her, looked at her transcript and asked, very simply "Y'know, you're wearing clothes that are covered in paint, you have your paint supplies with you, you've got art classes on your transcript, why are you doing art history? Why don't you just do art?" "Her saying ‘why don't you just do art?' opened up that possibility," said Wagstaff, who ever since has taken art class after art class to make up for lost time, and even stayed in Williamsburg over the summer to rack up some credits while using her free time to work in the studio. Her summer stay at the College also afforded her the opportunity to enter an art contest in Norfolk. All three of the works she submitted were featured in the contest's art show, and one, a still life of a pear Wagstaff had completed for a summer course, took first place. A study abroad experience finally convinced her to pursue art full- time. "I studied abroad in Florence and had the opportunity to participate in a student show at the end of the semester," she said. "Being surrounded by talented art students and seeing what people my age were doing with art really made me want to be a part of that." The art major says that her submission to the Charter Day art contest, while it shares the pear's focus on the inanimate, is a throwback to her ever-present interest in people and the ways they interact. "Architecture can still represent human presence," she said. "And still life can too. I really like the body and people interacting in a space more, but you can still sort of see that architecture. Barrett is just a solid static representation of the human presence on this campus." 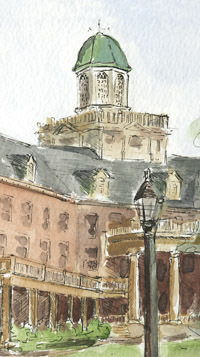 The inherent human presence in Wagstaff's watercolor was evident to the contest's judges as well and enabled the senior to take first place in a year where the theme was "There's only one William & Mary." The contest itself traces its origins back to 2007 when Cindy Baker, the College's director of publications, used a drawing of the Wren Building by student intern Lillian Selby '06 as the cover of the Charter Day program. "It was a big hit with attendees," Baker recalled. "And I thought ‘Wouldn't it be cool to showcase student art on the cover and maybe with a contest even start a tradition?'" Today, the winner of the Charter Day art contest not only gets his or her work on a program, but also has the opportunity to have their winning submission purchased by the President's Collection of Faculty and Student Art. According to Aaron De Groft '88, director of the Muscarelle Museum of Art and one of the contest's judges, Baker's brainchild is making a positive and palpable difference in the way students view Charter Day. As a comparison, De Groft recollected that "As an undergraduate we never knew what Charter Day was. Homecoming, we got that. Charter Day, not on the radar as a student... To then have this contest where you have to go out and look at your historic campus, look at the buildings, look at the views, maybe you'll appreciate it in a way that's very different than just simply walking around every day between class." Fellow contest judge Brian Focarino '10 also shares Baker's objective to make Charter Day more visible to students. "I think it's excellent that the administration is reaching out to students to involve them," Focarino said of efforts to "buff up" what he lovingly refers to as "the birthday of William & Mary." The senior said he was very pleased over being invited to the judge's table, saying that "from a student perspective you can find what the average student might find aesthetically appealing." And as for the entry selected by that body as the winner, both Focarino and De Groft have nothing but praise. De Groft felt that "it was very very nicely done as a watercolor, and the angle at which it depicted Barrett Hall was very compelling." Focarino expressed a simpler yet equally sincere sentiment, "I thought the artist did a great job." As for the artist herself, she is getting ready to move on. After graduation, she'll relocate to Baltimore and eventually attend graduate school, but not before she takes a year off to do some work on her own. "I feel like I really need to keep developing my painting and drawing and just find a direction," Wagstaff explained. "When you're in school, a lot of times you're in the studio and the professor sets up a still life or an interior with a model you don't really have a chance to paint what you want to paint. And you may not even know what you want to paint. I just want to go, set up a studio somewhere, and have to do all the work myself. Have to find things that I want to paint, find my own inspiration." And even though Wagstaff's work in the future probably won't go in the direction of the Barrett watercolor, the artist says she does hope to hold on to the one element of the painting she liked the best; its simplicity. "I'm drawn to simplicity." she said. "You wouldn't think of Barrett architecture and colonial architecture as being simple, but it actually is. Simplicity can be very beautiful."